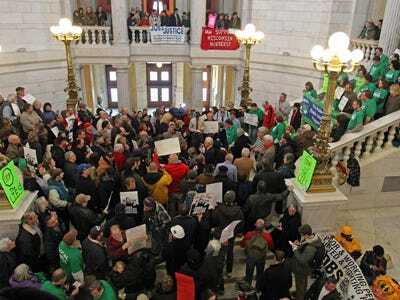 The clash between public worker unions and Republicans in Wisconsin escalated this week, with union supporters now organising similar demonstrations at statehouses across the country. Union members and their allies are rallying to oppose legislation that would curtail collective bargaining rights, curb earnings and impose furloughs on public-sector employees in 17 states, Bloomberg reports. The groups are demonstrating against what they see as a national attack on public-sector workers. This tension is only likely to increase as broke states struggle to balance their budgets and the disparity between public and private pay, pensions, and benefits grows. 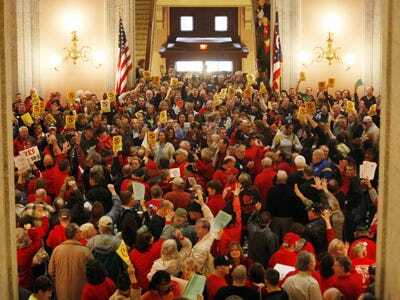 OHIO: Thousands of workers travel to Columbus to protest anti-union legislation. Buses brought thousands of protesters from across the state to Columbus today to protest a Republican-backed bill that would restrict collective bargaining rights for public-sector workers, including police and firefighters. The bill also requires government workers to pay at least 20% of healthcare costs and would eliminate automatic pay increases. Ohio faces an $8 billion budget deficit. Government workers in Ohio make about one-third more than those in the private sector, largely because they are more skilled and better educated. 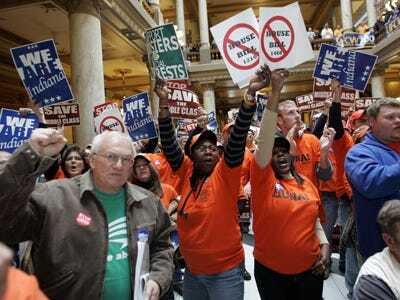 Taking a page out of the Wisconsin playbook, Indiana Democrats fled the state today to avoid a vote on a bill that would stop unions and companies from negotiating contracts that require all employees to pay dues or belong to a union. Thousands of union members and labour supporters crowded the statehouse in Indianapolis on Monday and Tuesday to protest the legislation. The 50,000 member Indiana State Teachers Association and other labour groups said they plan to demonstrate at the statehouse every day this week. 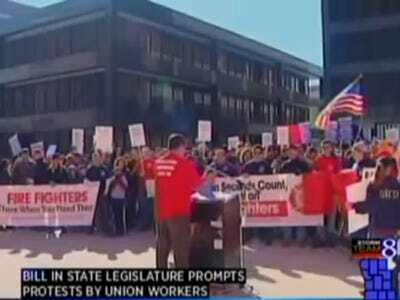 MICHIGAN: Union workers protest Gov. Rick Synder's budget proposals. Hundreds of union workers gathered in Lansing Tuesday to protest three House bills that would give the state's emergency financial managers the power to remove elected officials and break labour contracts in their efforts to turn around financially struggling schools and cities. The legislation would also make Michigan a 'right-to-work' state. 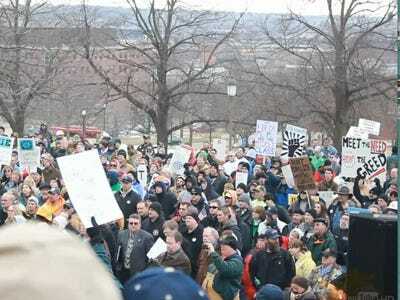 IOWA: Protesters rally to protect collective bargaining rights. More than 500 people rallied on the statehouse steps in Des Moines Tuesday to show support for public workers fighting to protect their right to negotiate. Union leaders warned that a similar threat exists for government employees in Iowa, where a state House committee is considering a bill that would limit collective bargaining rights for state workers. The legislation would take health-care benefits off the bargaining table for public-sector unions. 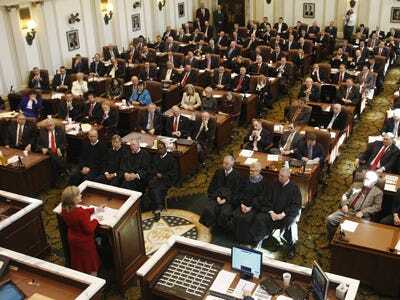 OKLAHOMA: Government workers protest the state legislature's pension reform plan. About 200 people gathered outside the Capitol building in Oklahoma City Monday to protest Republican-led efforts to overhaul the state pension system. The legislation would require a pension plan to be at least 80% funded before cost-of-living adjustments could be approved. The rally was sponsored by the 10,000 member Oklahoma Public Employees Association, which says changes should be part of a package that includes better salary and benefits for public workers. Oklahoma's state workers are paid about 16% less than private sector workers with similar job experience and requirements, according to the state Office of Personnel Management. The average retiree in the Oklahoma Public Employees Retirement System receives $15,000 in benefits each year. NEVADA: Public-sector workers hold solidarity rallies across the state. More than 1,000 workers rallied in Las Vegas and Carson City Monday to show solidarity with Wisconsin workers. 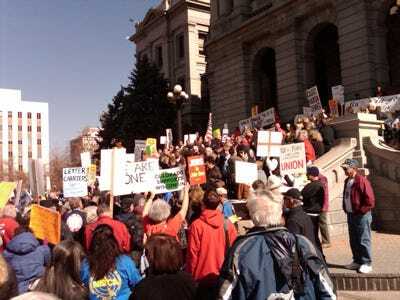 Outside the statehouse, union members and supporters protested Republican Gov. Brian Sandoval's 2012 budget proposal, which includes a 5% cut for all state workers. 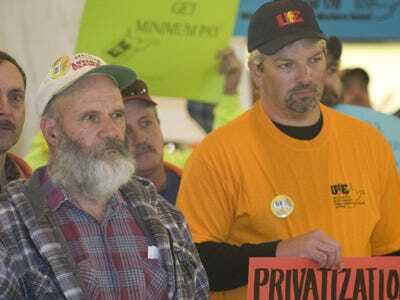 WEST VIRGINIA: Workers demand raises and better safety standards. 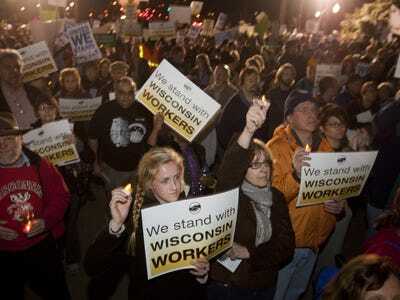 In a show of solidarity with the Wisconsin protests, public-sector workers in West Virginia rallied Monday to demand better pay and working conditions. State employees are asking for the elimination of a 2005 pay freeze, a 3% cost-of-living adjustment, and seniority rights. Workers also want the state to fund the West Virginia Occupational and Safety Act, which was passed in 1987 to regulate workplace safety but has never been funded. 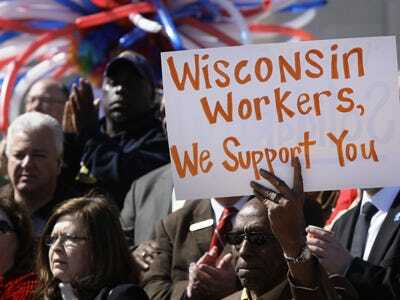 RHODE ISLAND: labour unions show support for Wisconsin protesters. labour unions in Rhode Island rallied at the statehouse Tuesday afternoon to show solidarity with Wisconsin public employees. Rhode Island is facing a $290 million budget deficit for 2012. The state has a $4.3 billion unfunded pension liability, much larger than Wisconsin's $252.6 million obligation. CALIFORNIA: Solidarity rally draws huge crowd in Sacramento. More than a thousand union supporters rallied in solidarity with Wisconsin workers in Sacramento and Oakland Tuesday night. Republicans in the California state Assembly introduced a bill Tuesday that would strip public employees of their right to bargain for retirement benefits. Although a Wisconsin showdown is not likely in deep-blue California, Republicans and business groups are pressuring Gov. Jerry Brown to include more union concessions - including pension reform - in his plan to close the state's $25.4 billion budget shortfall. TEXAS: Union members hold vigil to show their solidarity with the protesters in Madison. 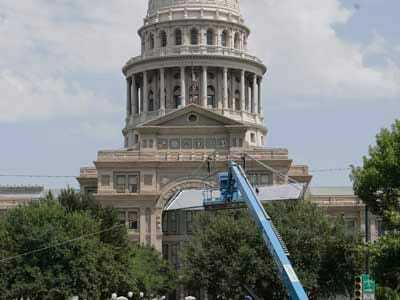 The Texas chapter of the AFL-CIO held a vigil in Austin Monday night in support of Wisconsin workers. Public employees in Texas actually have it much worse than those in Wisconsin, as most government workers in the Lone Star state do not enjoy collective bargaining rights. Texas is facing a budget shortfall of up to $27 billion over the next two years, which will likely mean layoffs in the public sector. Some predict as many as 100,000 school employees could lose their jobs. Gov. 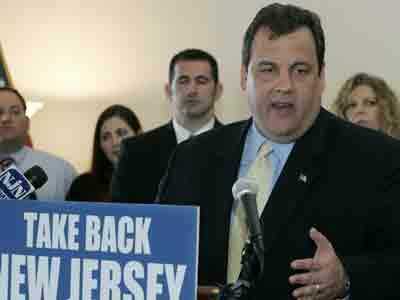 Chris Christie proposed a $29.4 billion budget Tuesday that would increase state worker pension contributions. Christie, who skipped last year's $3 billion payment to the state pension fund, said he would only make a payment this year if the state legislature passed a plan to increase the amount public employees pay for their pensions and healthcare. The $300 million in increased contributions would help pay for $1 billion in property tax relief. Unions plan to rally Friday to protest Christie's budget plan and show solidarity with public workers in Wisconsin. Christie has spoken out in support of Wisconsin Gov. Scott Walker's emergency budget proposal, which would sharply curtail public employee bargaining rights. A Republican-backed state bill in Tennessee would end collective bargaining rights for teachers. 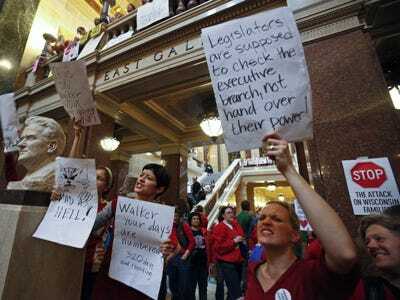 Teachers unions plan to protest the legislation next month. Colorado Gov. John Hickenlooper, a Democrat, has proposed that public employees take on a greater share of their pension costs. State workers, who do not enjoy full collective bargaining rights, rallied in Denver Tuesday to support Wisconsin workers. Florida Gov. Rick Scott's budget plan includes a measure that would require public workers to contribute as much as 5% of their pay into the state pension fund. In Nebraska, a proposed bill and constitutional amendment would abolish collective bargaining and eliminate the Nebraska Commission of Industrial Relations, which resolves wage and benefit disagreements for public workers. The Missouri State Senate is considering legislation that would significantly weaken the state's child labour laws. A legislative committee is also considering a 'right-to-work' bill. A state bill in New Mexico would limit the collective bargaining rights of public employees, who also face increased pension contributions under the state's proposed budget plan. 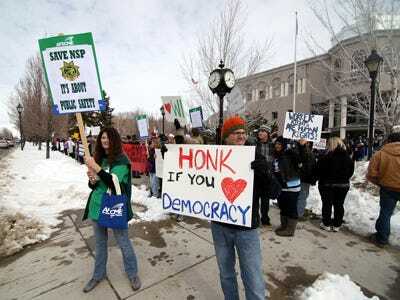 State workers held Wisconsin solidarity rallies in Santa Fe and Albuquerque Tuesday.